Broadly speaking, the Indian Equity Markets continued with its up move and stepped into the new week on a buoyant note. Though the Markets remained in a capped range, the benchmark Index NIFTY50 ended the day with gains of 47.05 points or 0.44%. Tuesday was a trading holiday on account of Maharashtra Day. Indian Markets will enter into trade on Wednesday, therefore, after a day or slumber. Speaking from a global perspective, the day in between has remained largely uneventful. US Markets closed with a modest loss while Europe has traded with modest gains. Going into trade on Wednesday, we expect a quiet start to the session and we can see Markets showing modest strength in the initial trade with some possibilities of consolidation happening again. We will see the levels of 10750 and 10805 acting as immediate resistance. Supports, on the other hand, will come in at 10675 and 10620 zones. Relative Strength Index –RSI on the Daily Chart is 69.97. It has marked yet another 14-period high. This indicates continuation of buoyant undercurrent. RSI remains neutral showing no divergence from the price. The Daily MACD continues to trade bullish, above its signal line. On the Candles, a white body occurred. This implies continuation of the present up move. Apart from this, no significant formations were observed on Candles. While having a close look at pattern analysis, it is evident that the NIFTY deliberated at the upper range of the rectangle formation for sometime before breaking out. Though this remains prone to some throwbacks, we can clearly see a breakout taking place above the 10500 mark. Overall, there are no major triggers that would influence any sharp movement in the Markets on either side on Wednesday. 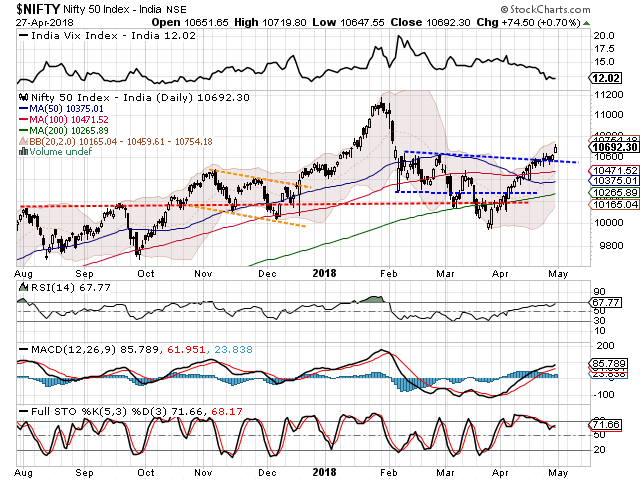 We will see NIFTY attempting to inch higher. 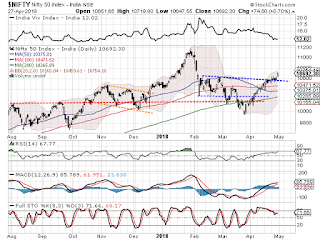 However, the Markets are very near to being overbought and this would mean that it remains prone to some consolidation once again at higher levels. The Bollinger bands are seen getting wider-than-its normal range. Also, the volatility is seen at its lowest levels seen in the recent past. All this may push the Markets under some consolidation and limit them in a range. Stock specific action will dominate the session. We recommend remaining highly stock specific while guarding profits at higher levels. Good technical set up is observed in stocks like First Source, IRB Infra, VEDANTA, NATIONAL ALUMINUM, CANARA BANK, INDIAN OIL, JET AIRWAYS, TATA STEEL, NCC, CG POWER and BHEL.